Technology now forms a cornerstone of education, and children of all ages are expected to use computers for their work, whether it's in primary, secondary or further education. Schools and colleges are now well equipped with libraries and computer rooms, which children can use before and after school to research and write their homework. However, a PC at home is now pretty essential to get the most out of education, and the good news is that it doesn't have to cost the earth thanks to our how to get the best Back to School deals guide. With its 180-degree reinforced hinge, rugged build and sealed keyboard and trackpad, Dell has created the perfect Back to School Chromebook. Although the Dell Chromebook 11 isn't the most vibrant looking Chromebook, it's been built to survive knocks, drops and bumps which come with the territory with computers for kids. The keyboard and trackpad are comfortable to use, and with loud stereo speakers built in to the body, the Dell Chromebook 11 is also great for entertaining children when they've finished their schoolwork. This brightly colored Chromebook will certainly get your children's attention, and it's compact design makes it easier for little ones to carry around and use. The screen is bright, clear and vivid, and it's an excellent device for browsing the internet, playing educational games and doing a spot of homework on. For a modest investment, you'll get a responsive, friendly-looking notebook that's actually fun to use despite some minor shortcomings. This is another brightly-colored Chromebook that's ideal for kids to use for their school work. It has a battery that lasts all day, so your kids won't be stuck without their trusted device halfway through a school day, and it's got an affordable price tag as well. The Acer Chromebook R11 can also be turned into a tablet device, with the touchscreen allowing younger children who are used to standard tablets, to use the Chromebook as well. Many parents and guardians find buying a computer for their children extremely stressful and challenging, and there's a lot to consider before shelling out. Children are often geniuses when it comes to computers, and can easily outstrip many adults in terms of ability, so there's often a clash between the expectations and desires of the child, and what's affordable and practical for the parents. We've attempted to make the buying decision simpler, by looking at what's on the market and addressing key concerns. We're going to look at computers and other gadgets for all ages, cover all budgets, and explain the technologies your children need and what they don't. Most importantly, we're also going to look at what's on offer to get more from your computer, so children can get the most out of their education. Proficiency in computers and technology isn't a challenge for children these days, and anyone with small children will be constantly amazed by their ability to become overnight experts on the latest gadgets. Giving your children some kind of secure internet access is now essential, whether it's for researching those early bits of homework, learning in a fun and interactive way or just to give them the skills they need to operate in a technological world. Even at the educational level that covers five- to seven-year-olds, ICT (Information and Communications Technology) makes up an important part of the curriculum. At this level, children are expected to gather information from sources such as CDs, DVDs, videos and computers. They're also expected to use tables, text and images, and present their ideas in different forms. Many adults would find this level of computer literacy frightening, but it shows how essential it is for all children to have access to ICT from a young age. Buying a computer for small children is one of the biggest headaches, because there are a number of decisions that need to be made. The first is what exactly they're going to use it for. Getting creative, looking at photos, and simple bits of homework are all that children really require. This means that parents are normally faced with two options when the kids go back to school: fork out for a new computer for small children, which is an expensive option, or let them use the family computer, which has its own problems. However, there is a third way. Chromebooks make great computers for children, and can help end arguments and conflict about using the main home computer. Chromebooks are tiny laptops that are low-power, small in size, and most importantly, low in cost. While many adults find them uncomfortable to work on due to the small screen and keys, this only makes them more ideal for children. 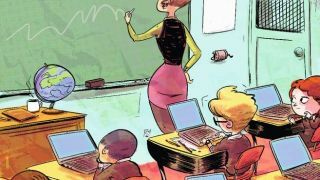 What's more, the format came about when looking at how to introduce laptops into schools in developing countries, so they were originally designed with children and education in mind. The idea of letting children loose on their own computer is enough to terrify most parents, and we'd never advocate unsupervised web surfing. However, investing in a Windows 10 laptop or computer enables you to use the built-in parental control features, which mean you can enjoy unprecedented peace of mind, so you can ensure that children can enjoy the internet without stumbling across nasty content. Click the Start button at the bottom of the screen and choose Settings. Select Accounts followed by 'Family & other users'. You'll see user accounts are split into two – as we're adding younger family members, click the 'Add a family member' button. You need to set up individual accounts for any younger users first, and also set passwords on all usernames, so that children can only log in using their own account. Make sure you make theirs a standard account, which differs to your administrator one, meaning that they can't make system changes to the computer or override the controls that you're about to set on their account. Once the user account is set up, you can start adding restrictions that make the account safe for children to use. First, you can specify times that the account can be used. If you only want your children to use the computer for two hours a day – between 5pm and 7pm, for example – you can set this up automatically, and end arguments about computer use. For more information on setting up parental controls, check out our guide on how to use Family Safety parental controls in Windows 10.